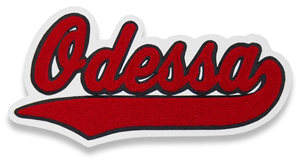 Chenille name patches for varsity jackets are a breeze thanks to our top-of-the-line custom chenille software, wholesale ordering system, and talented employees. We are one of the largest manufacturers of these beautiful products in the United States and use only American workers as part of our business model. Our chenille name patches can be customized with sweep tails, multiple layers of felt, and virtually any color combination. We offer embroidery accents, and almost any size you need, whether for a varsity jacket, letter sweater, or team uniform. If you have specific requests, such as a non-standard font, we can probably accommodate you, thanks to our talented art department and top-of-the-line software systems. For re-orders, these can be added to your account manager in our wholesale ordering system so fill-in orders can be placed within seconds, customization and all!